Racers get an off-road Traxxas Slash Short Course Truck and two battery packs. Rental time last between 30-40 minutes depending on driving habits. Drive it like you stole it! We cover all damage to vehicles! Looking for something to do in the Visalia Tulare Area? 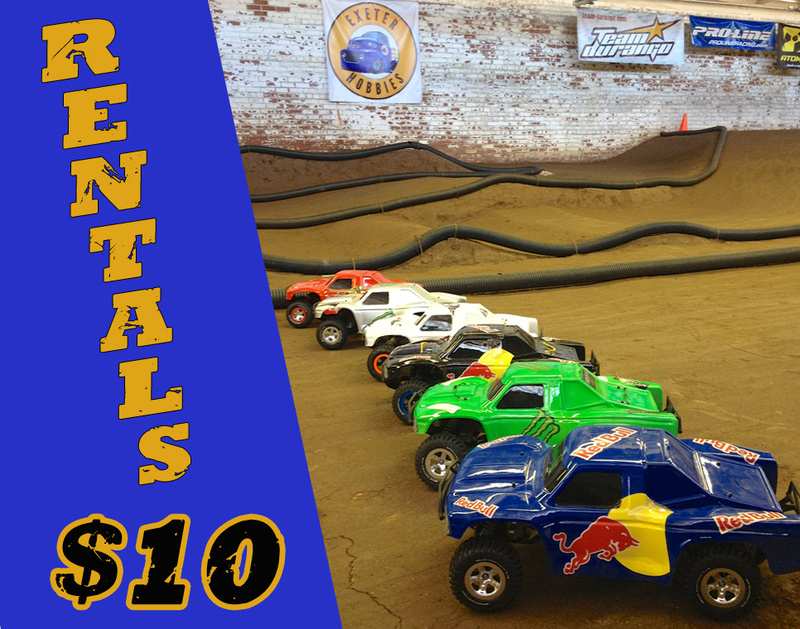 Come out to Exeter and race our trucks on our indoor off-road r/c track. We offer party packages or individual rentals 7 days a week. Corporate team building, company parties, bachelor parties and so much more! We are located at 130 E Maple St. Exeter Ca 93221 Just south of the main st in Exeter (Pine) at F st. Big brick building on the corder of Maple and F. Hope that helps. Call 559-592-4883 for more help. Do you carry Traxxas parts? This place rocks. Just wanted to drop in and say thanks. My son and I had a blast. This place def- brings out the kid in you. Staff is very knowledgeable and helpful. Oh yeah, the art on the rock climber wall looks bad aya. We rent the Traxxas Slash but we put them on “Training mode” because for more the track is challenging at full speed. Full speed may be around 20 mph or so but I would guess on our track in training mode they are doing 10-12mph. But trust me, no one is ever telling us “i wish they went faster”. Come try it out! There is videos on our facebook and youtube if you want to see what the track is like. Do you sell 2S/3S LiPo batteries and chargers? If so, what charge Amp are the chargers and are they AC/DC/Both? Thank you for your time. Yes we sell several models and all of them have AC/DC inputs. So… It’s 1/10 slash 2wd? LiPo or NiMh? Are you able to run your own cars on the track or just the rented cars? How much is it if you are able to run your own car on the track? Sure, as long as it’s electric. We prefer 1/10 scale only but smaller scales are ok if your alone or you understand the risks of possible damage from other cars and trucks. Cost is $10 for unlimited use all day. Weekends are crazy though because of parties so expect the track to be pretty busy. Mornings are best if you want the track to be as empty as possible. What are the preferred tires for the indoor track? Are there outlets to charge your batteries inside at the track? You would have to call the store, there are plenty of options but our dirt is old and traction is limited. We are not longer doing club racing there is not a lot of feedback on tire options at the moment. Sorry I could not help you. There are plenty of pit tables and outlets for your to work and charge from. What can a little sister, age 4, do while everyone else is racing? Well we have a place she could sit and watch, we also have corn hole and giant jenga to play with. Families of all sizes and ages come here ever day.